Here’s a great gift for the audiophile on your list. 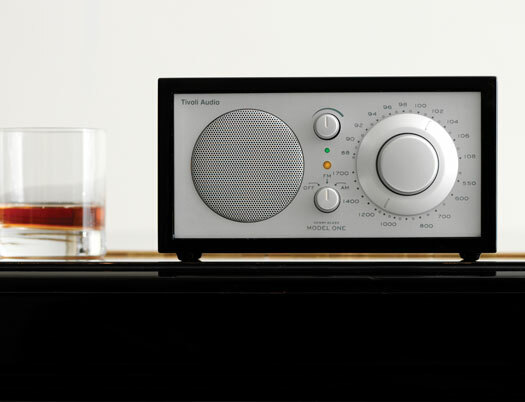 The Tivoli Platinum Series Model One Radio® in piano finish. This entry was posted in Living and tagged Christmas, gifts, Living. Bookmark the permalink. I had a beautiful Roberts Radio when I lived in the UK, but it wouldn’t work here. It was so classic and had great sound. Fairfax — it might. Converting down from 220 to 120 doesn’t pose the same risks that trying to convert up does. At least I had an electrician/contractor tell me that once in relation to a german art deco bar that we have. Of course I haven’t had the gumption to try it out. It’s actually the bands that were the main issue. it’s got digital and long and short wave on it. i couldn’t figure out how that would work over here. i think the television and radio operate on different frequencies there.